Copperfield’s Lair and Welles’ Harness! Part 2 of 2. A recent blog post detailed my delightful visit and tour of David Copperfield’s unique Las Vegas HQ. Well one really neat thing happened during my visit and I want to share it with you in this weeks column. It involved David’s magnificent museum that is housed in his warehouse complex. One of the museum’s major exhibits was dedicated to Orson Welles and his career as a magician. Welles was the host of David’s first television special and due to this obviously holds a special place in his heart and history. 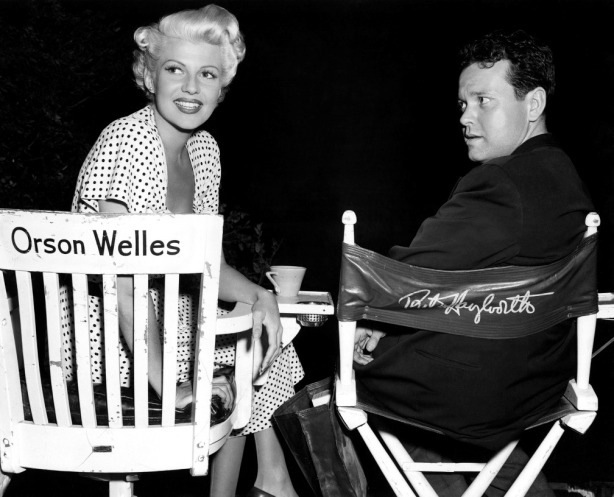 Several of the props on display were from the famous Orson Welles/Rita Hayworth USO tour that took place during World War Two. 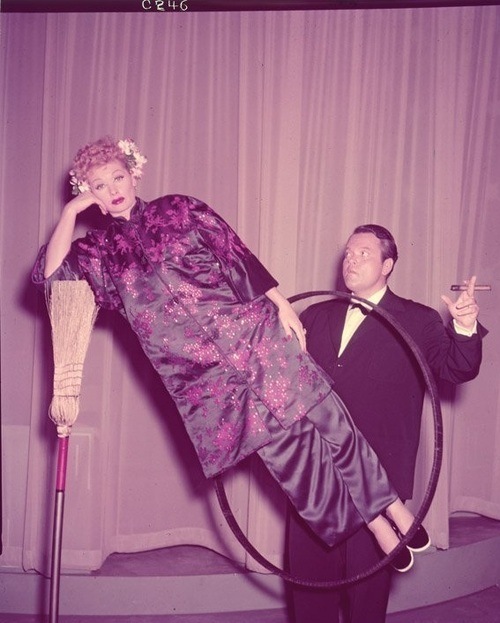 In a casual manner I asked David if he knew who owned the Owen’s broom suspension harness that they had used on the tour, which Welles subsequently utilized with Lucille Ball on the ‘I Love Lucy’ show. He replied, with just a hint of exasperation in his voice that he didn’t, I could tell the question went right to the collector in him. I replied in the same casual tone, “Oh, I do.” There was a brief silence. 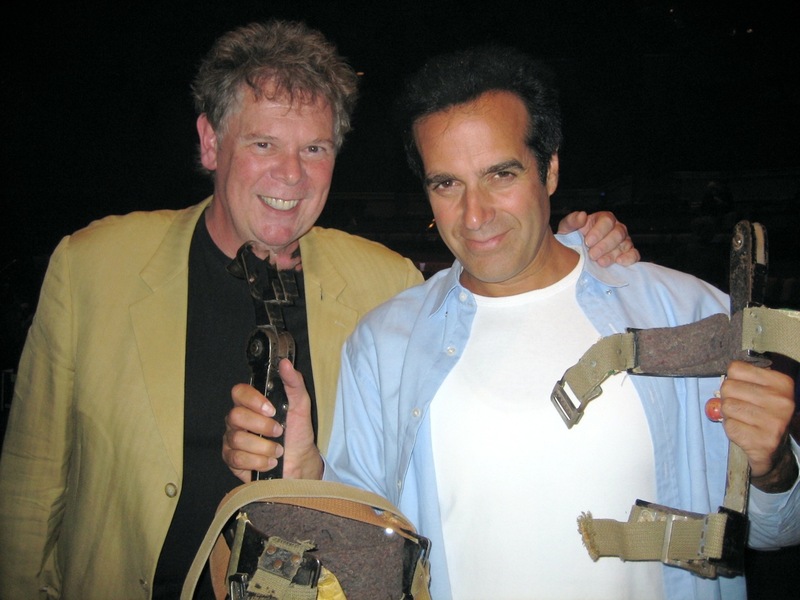 Copperfield looked at me rather sharply and replied, “…but you’re not a collector.” He did of course have a very good point—I have avidly collected many things in my life, but never magic props. This just happened to be one of the two collectible items that I did own, and this was a sheer coincidence. As far as I was concerned it had always been a working prop. In fact, I am so unexcited by magic props that this fascinating relic was residing somewhere in my garage in an old duffle bag in a rather unloved condition. I had bought the prop from Piet Paulo, who had acquired it from the Chuck Kirkham collection. The prop had been hand made by Carl Owen for Orson Welles and especially fitted to the delightful contours of Ms. Hayworth. After the couple’s USO tour the broomstick suspension was passed on from Welles to Kirkham, with the condition that if Orson wanted to perform it then he could borrow the props back from Chuck. This did in fact happen on seve ral occasions and with the assistance of Kirkham, and sometimes his wife Phyllis, Welles presented the illusion in his own inimitable and grandiose style on several outings. The famous ‘I Love Lucy’ episode was one of these occasions. I just happened to be in the right place, with the right cash, to pick up the harness when I needed it for a corporate event. I discarded the brooms and used it for a microphone suspension. That harness was a gorgeous, but incredibly heavy prop! After using it for several years my partner BooBoo gave me an ultimatum–it was a lighter harness or a new assistant —the decision was easy. The harness went into my garage and stayed there. Looking at all the wonderful props on display in David’s museum gave me more than a slightly guilty pang and I made an instantaneous decision, “Would you like it for the museum?” I said. David replied, and this may not surprise you, “Yes!” I was just delighted to think that this wonderful prop would find a new home, where it would be better housed than in a duffle bag in a overcrowded garage. I thought the history of the prop left it deserving of a better fate. A couple of weeks later my daughter Natasha and I took the harness down to the MGM Grand and after catching David’s performance, it officially changed hands once again. I have posted some photos of the harness and some of these moments in its history on my blog if you want to check them out at www.remarkablemagic.com and you might enjoy the visuals. As a big fan of Orson Welles, Piet Paulo and David Copperfield I relish having my own little place in the history of this iconic and unique prop. It’s probably good for a couple of comps to David’s show too, if I ever want them! ~ by Nick Lewin on April 5, 2013.